This post will be an attempt to piece together the tools and various attempts into a coherent step-by-step guide. We will start by setting up the tools needed, and then build an iOS app that runs in both the simulator and on the device itself (i.e. a x86 build and an arm build). 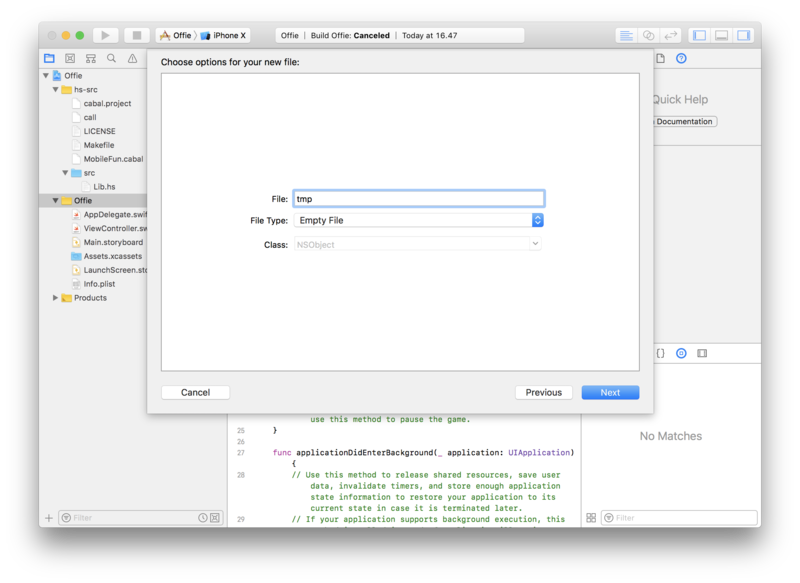 and finally launch Xcode and start the simulator. A bunch of tools are needed, so we will set these up first. You might have some of these, but I will go through them anyways, for good measure. The steps will assume that we are on macOS for some parts, but it should not be part to adapt these to your system (all steps using brew). Next step is cloning down cabal and building cabal-install. This is necessary until new-update lands. If you have cabal-install and a system GHC already, then you can try and install it via cabal new-build cabal-install instead, which is less brittle. I wanted to remove the need to setup these though, so I went with the ./bootstrap.sh approach. NOTE: If you are having trouble with e.g. errors on packages being shadowed, try the good ol’ cabal-hell fix, and nuke ~/.ghc and ~/.cabal/. This should set up LLVM in /usr/local/opt/[email protected]/bin (or just /usr/local/opt/llvm/bin), remember this path for later. We’ll now set up the tools from http://hackage.mobilehaskell.org, namely the toolchain-wrapper and the different GHC versions we will use. And that’s it! We have now set up all the tools we need for later. 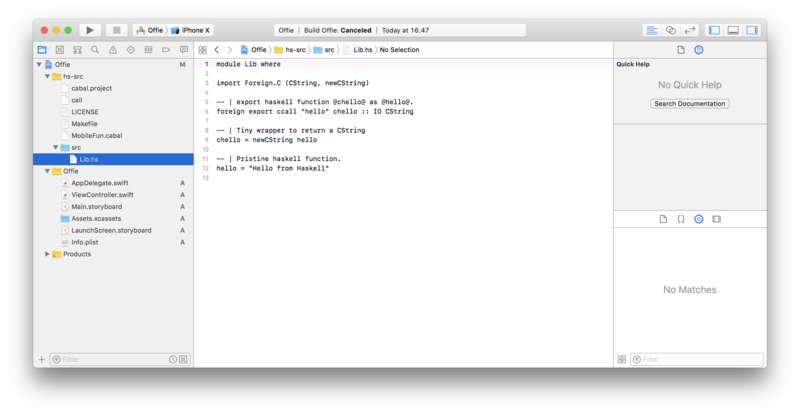 If you want all the steps as a single script, check out the setup script in the MobileHaskellFun repo. 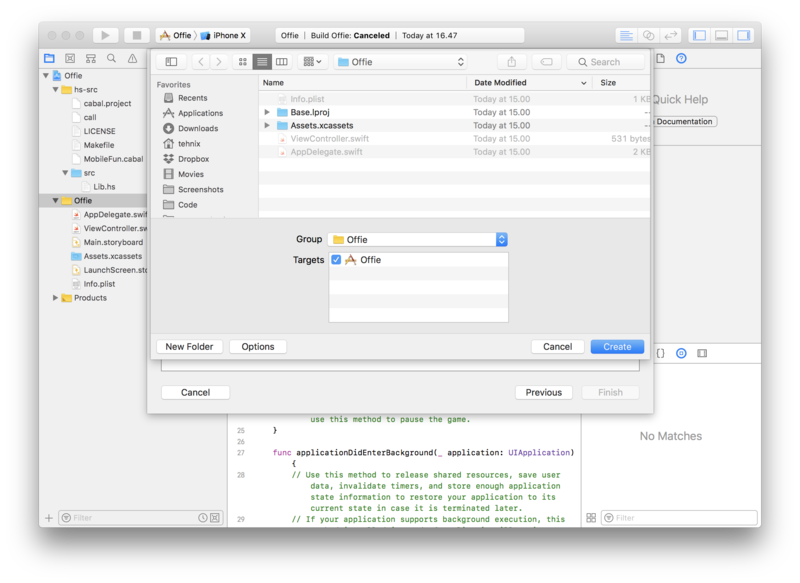 Setting up Xcode is a bit of a visual process, so I’ll augment these steps with pictures, to hopefully make it clear what needs to be done. 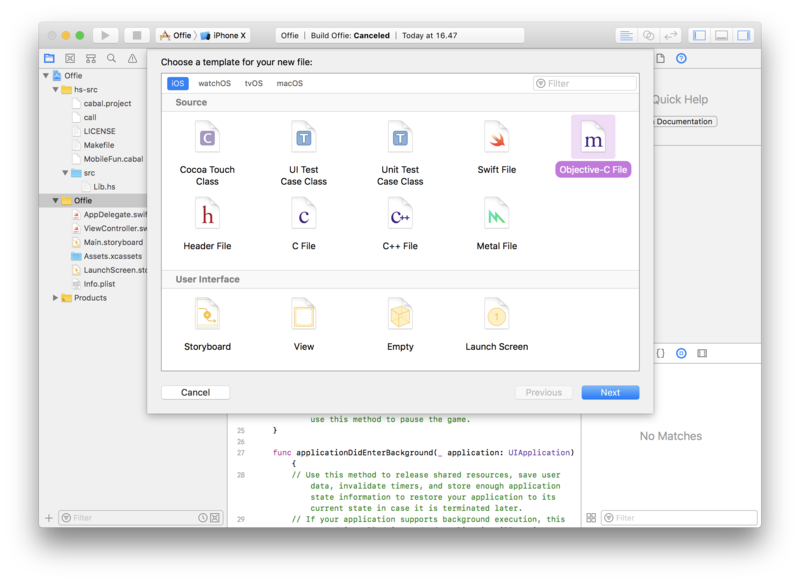 First, let’s set up our Xcode project, by creating a new project. We use the features of cabal.project to set our package repository to use the hackage.mobilehaskell.org overlay. Just a simple cabal package setup. The Makefile simplifies a lot of the compilation process and passes the flags we need to use. Our Haskell code for now, is simply some C FFI that sets up a small toy function. -- | Pristine haskell function. hello = "Hello from Haskell"
We use the call script to set up the various path variables that point to our tools, so we don’t need these polluting our global command space. If you’ve followed the setup so far, the paths should match out-of-the-box. # Path to Cabal HEAD binary. # Pass everything as the command to call. Now we can build our project by running make on our target. For now, we have only set up iOS, so this is what we will build. 'cabal.project.local' file already exists. Now overwriting it. We should now have our library file at hs-src/binaries/iOS/libHSMobileFun.a. If you change your project, to will probably need to run ./call make clean before running ./call make iOS again. 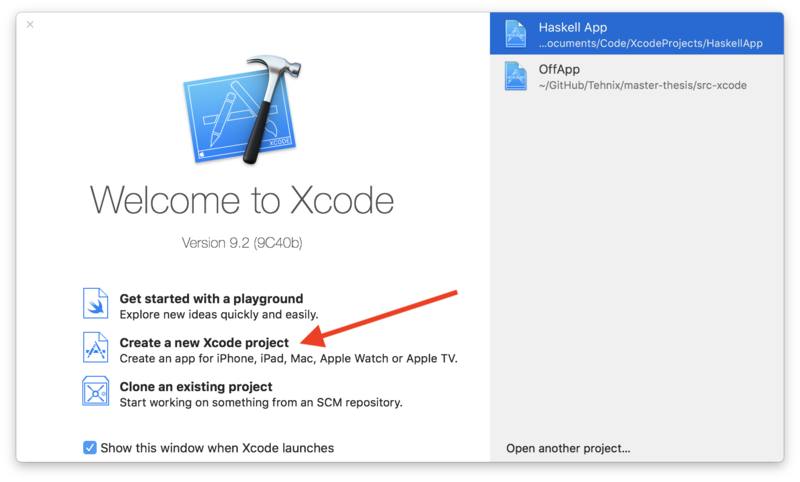 Now we need to tie together the Haskell code with Xcode. 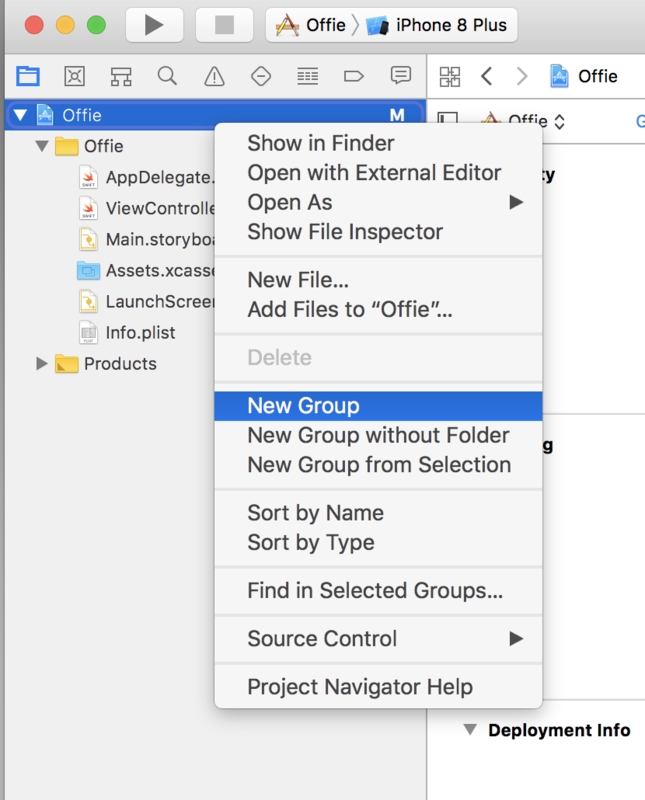 Drag-and-drop the newly created files into the hs-src group in Xcode (if it hasn’t found it by itself). Since we are using Swift, we need a bridging header to bring our C prototypes into Swift. 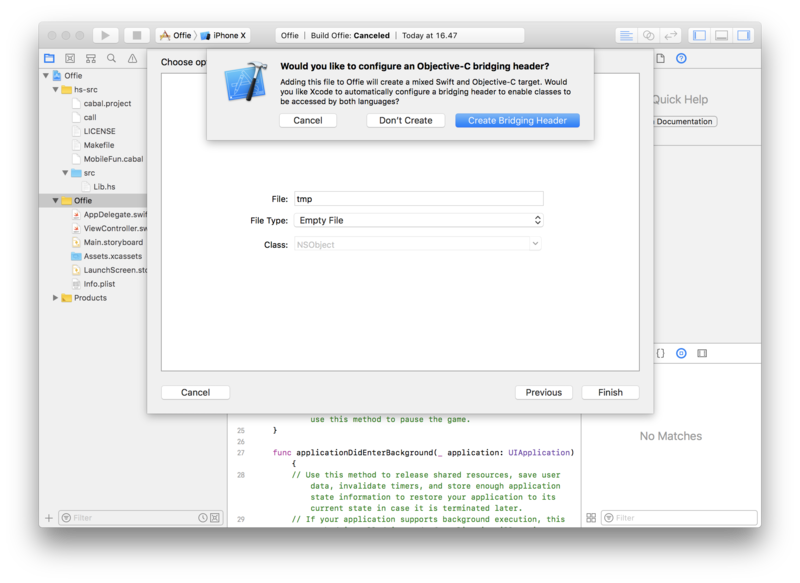 We’ll do this by adding an Objective-C file to the project, tmp.m, which will make Xcode ask if we want to create a bridging header, Offie-Bridging-Header.h, for which we will answer yes. Next, we will set up a label in a view controller. You can either set this up in the story board and connect it via an IBOutlet. First go into the Main.storyboard and create a label element somewhere on the screen. 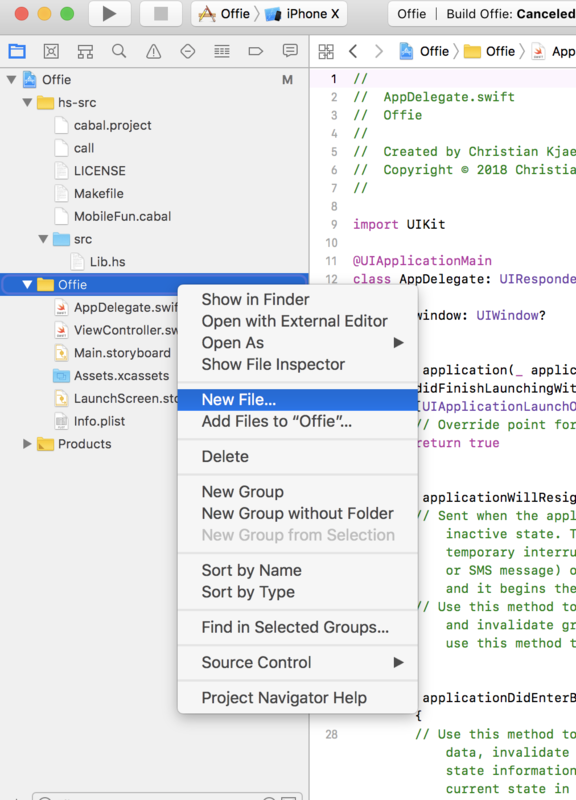 Then enable the Assistant Editor in the top right cornor, and ctrl-click on the label, dragging it over to the ViewController.swift and name helloWorldLabel. The final step we need to do, is linking in our library that we built earlier, hs-src/binaries/iOS/libHSMobileFun.a, so that Xcode can find our C prototype functions. We also need to set the build to not generate bytecode, because we are using the external GHC library. This is done under Build Settings, locating Enable Bitcode (e.g. via the search) and setting it to No. Congratulations! 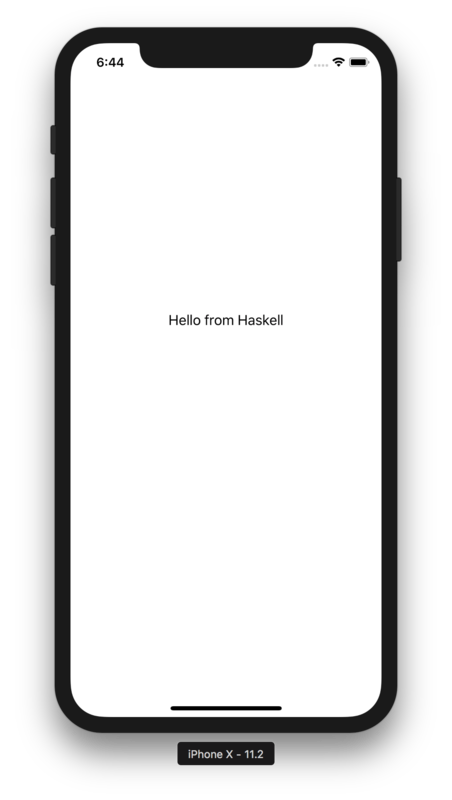 You’re now calling Haskell code from Swift and running it in an iOS simulator. NOTE: You might run into a problem like could not create compact unwind for _ffi_call_unix64: does not use RBP or RSP based frame in your Xcode builds. You can fix this by adding libconv to your libraries in Build Phase. A Haskell Cross Compiler for iOS and some of the other medium posts. Various issues on the mobile-haskell/hackage-overlay (#5, #2). If you are interested in following the development of Haskell in the mobile space, I recommend following @zw3rktech and @mobilehaskell. Finally, let me know if something is not working with the MobileHaskellFun repository. I haven’t dealt that much with setting up Xcode projects for sharing, so I’m a bit unclear on what settings follow the repository around. If you want to grab the whole code from this post, it can be found at codetalkio/Haskell-Electron-app. Electron has a nice quick start guide, which helps you get going fairly, well, quick. For our purposes, the following will set up the initial app we will use throughout. And that’s it really. You’ve now got a basic Electron app running locally. The npm start command is what launches the app for you. But! Before doing anything more here, let’s take a look at the Haskell side. We’ll be using servant for a minimal application, but you could really use anything that will run a web server (such as Yesod, WAI, Snap, Happstack etc, you get the idea :). which will download the servant project template for you (from the stack templates repo) and build it. For the lack of a better named I have called the application backend, but it could really be anything you fancy. For now, let us proceed with Electron and servant running separately, and later on explore how we can start the servant server from inside Electron. Since the servant template project has given us the endpoint 127.0.0.1:8080/users from which it serves JSON, let’s set up Electron to call that and display the results. Short interlude: since I’m a bit lazy let’s go ahead and download jQuery 2.2.3 minified and put that into Haskell-Electron-app/haskell-app/resources/jQuery-2.2.3.min.js so we can include it later on and get the nice AJAX functionality it provides. Back to work, lets change the index.html page and prepare it for our list of users. // The JS file that will do the heavy lifting. And finally we’ll implement the logic in renderer.js. // Backend and endpoint details. $('#status').html(`Fetched the content after attemt no. // Keep trying until we get an answer or reach the maximum number of retries. // Convenience function for `_fetchUserList`. // Start trying to fetch the user list. We simply request the JSON data at http://127.0.0.1:8080/users, with $.getJSON(...), and display it if we received the data. If the request failed, we keep retrying until we either get a response or reach the maximum number of attempts (here set to 50 via maxNoOfAttempts). The real purpose behind the retry will become apparent later on, when we might need to wait for the server to become available. Normally you will use a status endpoint that you are 100% sure is correct and not failing to check for the availability (inspired by the answer Mike from Wagon HQ gave here). Now to the interesting part, let’s try to launch the Haskell web server from inside of Electron. First though, let us set the haskell-app/resources folder as the target for our binary, in the stack.yaml file, with the local-bin-path configuration value. Now let’s compile the executable. The --copy-bins (or alternatively you can just do stack install) will copy over the binary to Haskell-Electron-app/haskell-app/resources as we specified (it defaults to ~/.local/bin if local-bin-path is not set). After that, it is surprisingly easy to launch the executable from within Electron (well, easy once you already know how). We will change main.js to spawn a process for the web server upon app initialization (i.e. the ready state). Since there are bits and pieces that are added I’ll include the whole file, with most of the comments removed. // Used to spawn processes. // Do the same for the backend web server. // Start the backend web server when Electron has finished initializing. // Close the server when the application is shut down. Next step would be to package the app up for distribution to see if that affects anything, but I’ll save that for another time (and Electron already has a page on distribution here). This seems to be an often asked question, so I thought I’d try and share the approach that I’ve arrived at after having explored a couple of solutions to the problem. If you want to see the full code in action, check out the repo for the codetalk.io site (linking to v1.0.0 is intended, in case the code changes later on). NOTE: From personal experience an earlier version of hjsmin (0.1.5.3) would throw a parse error on some files (like jQuery). This has later been fixed in 0.2.0.1, but unfortunately Stackage is using 0.1.5.3 in the current LTS 5.15. To get hjsmin 0.2.0.1 working with stack, you can add the following to the stack.yaml file in the project. and hjsmin == 0.2. * as a dependency in the projects cabal file. Now we are ready to construct the compiler itself. Later on inside the main Hakyll function, we use it simply as we would the other compilers. For those who aren’t aware, there are other ways to write CSS than CSS. Sass and SCSS adds a lot of niceties to CSS, such as nesting, variables and mixins, and compiles to normal CSS. You can read more about that on their website. This time we rely on external dependencies, namely the sass tool, which can be installed with gem install sass. NOTE: There is a library called hsass, which provides a Haskell interface, but I’ve been running into problems with linking to the underlying C API. As such, I’ve opted for the external dependency for now. >>= withItemBody (unixFilter "sass" [ "-s"